Dr. Bruce Brown relishes his role as Composer in Residence with the JSO, where he hosts the popular Backstage Glimpses series of pre-concert lectures. 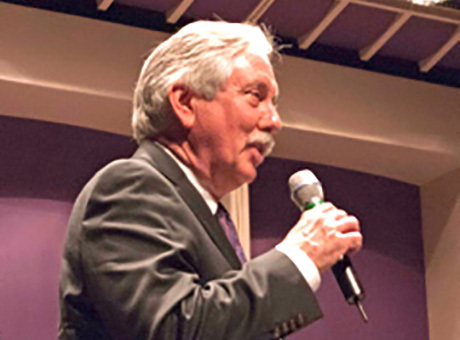 He retired in May of 2018 after 34 years at Spring Arbor University, where he served as a professor of music and the chair of the music department. His modern yet lyrical compositional style has made him a frequent recipient of commissions for new works. In recent years he has completed commissions for Consumer’s Energy, the 15th anniversary of the South Carolina School for the Arts, the opening of the new music building at Central Michigan University and the dedication of White Library at Spring Arbor University. His most recent works include Skyward!, a gift for the JSO’s new music director Matt Aubin, and Sound in Body, Mind and Spirit, a commission to celebrate the centennial of Henry Ford Allegiance Health. Brown has written many compositions for the JSO, including Legacy of Vision: Martin Luther King, which has been performed across the country, his Symphony for String Orchestra, which was recorded in Prague for release on the MMC label, and Quixote!, which featured a dynamic performance by viola soloist Clyde McKaney. In 2010, the JSO’s Music Director Stephen Osmond asked Brown to participate in a unique project, talking with the audience about a work in progress at each subscription concert while the orchestra played sketches from the music. The resulting work, Conversations and Dreams, was performed at the final concert of the season. This innovative idea caught the attention of Greg Sandow, who wrote about it in his widely-read blog about the future of orchestral music at ArtsJournal.com. In 2008, Brown helped lead The JSO Goes to School, a special project supported by a grant from the National Endowment for the Arts to help students at Frost Elementary School explore musical creativity and lend their ideas to a new piece of music, which the JSO performed at a special community assembly. Brown holds degrees from Central Michigan University, the University of Hawaii, and the University of North Texas. His compositions have been recognized by annual awards from the American Society for Composers, Authors and Publishers (ASCAP) since 1992.